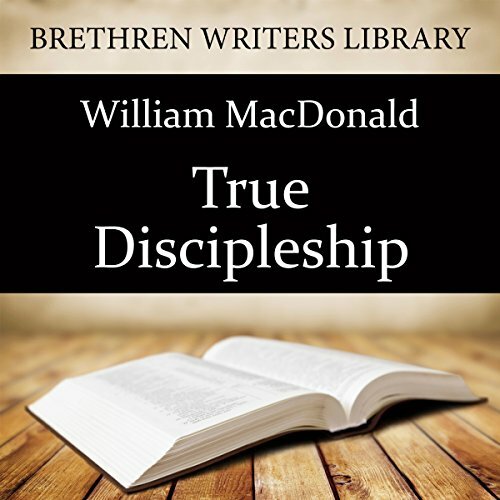 In True Discipleship William MacDonald highlights some principles of New Testament discipleship and challenges every genuine Christian believer. He makes clear that nothing less than an all-out commitment to the Lord Jesus Christ is required of us. The savior seeks those who will give him first place in their lives. To be a true disciple is to be a bond slave of Jesus Christ and to find that his service is perfect freedom. There is liberty in the step of all who can say, "I love my master...I will not go out free". As well as the original True Discipleship, the two booklets Where is your Treasure? and Lord Break Me ,also by William Macdonald, are included in this new version. A word about the author: William MacDonald (1917 - 2007). William (Bill) MacDonald was born in Massachusetts. His parents were from the Isle of Lewis and when he was six years old, his family moved to Stornoway, Scotland, later moving back to Massachusetts. A commended worker for 60 years, a teacher, preacher, mentor, and author of 84 books, including the Believer's Bible Commentary, William MacDonald was a man who said and wrote much. Yet, for those who knew him well, it was his life that left the greatest impression. Speaking of the Lord Jesus, the Bible says, "the one who says he abides in Him ought himself to walk in the same manner as He walked" (1 John 2:6). Bill wrote in his commentary, "Jesus' life, as set forth in the Gospels, is our pattern and guide. It is not a life which we can live in our own strength or energy, but is only possible in the power of the Holy Spirit. Our responsibility is to turn our lives over to Him unreservedly, and allow Him to live His life in and through us." So likewise, whoever of you does not forsake all that he has cannot be My disciple." The teaching is clear, concise and refreshing! The narration was absolutely fantastic. Thoughtful discussion of discipleship. Great for meditation. Didn't agree with all his opinions and interpretation, but many thoughts were different or new perspectives Definitely worth the listen. I would recommend this book to any serious disciple. It is so challenging and makes you take account of all areas of your life. What other book might you compare True Discipleship to and why? It is clearly written years ago. Originally written in the 1960's the seriousness of the Gospel of the older generation is clear. I would listen to this in one sitting. Will listen over and over again because there is so much fundamental truth in it. I can’t tell you how much I love this book! This is a must read for every believer. It is my personal goal to read this book at the beginning of every year. The contents in this book are fundamental to being a disciple of Jesus. To being owned by Jesus and not the world. To being an obedient disciple of Jesus who in turn equipped other to be the same.